The lesser known destination of Puerto Carrillo is a coastal village in the province of Guanacaste. This whole region is well known in Costa Rican, American and Canadian tourists, but has not yet had worldwide exposure. Situated along the Pacific Coast it is a jewel among Costa Rica’s Pacific beaches. The town itself is very small (less than 500 full-time residents) and is predominantly a sport-fishing village with a handful of nice hotels, restaurants, two small food markets, and tour operators. While there are only a limited number of hotels and places to eat in Carrillo, many options are available in the nearby town of Samara, just 4km away. The population in Carrillo is mainly local residents and still maintains an authentically Costa Rican atmosphere. Puerto Carrillo is a small unobtrusive community that has been playing host to some of the most renown sport fishing boats in the world, since its discovery as a billfish destination over 15 years ago. The tiny harbor affords protection to a small handful of charter and private boats that are there on permanent bases. The beautiful white sand beach has small waves most of the time and is popular with swimmers and families with kids. Playa Carrillo is never crowded and it offers nice picnic areas right on the beach. Popular activities are; whale and dolphin spotting, kayaking, fishing, horse-riding, hiking, cycling, turtle nesting, rain-forest tours, bird-watching and much more. Of course visitors can just lay by a pool or on the beach, topping-up the tan and enjoying the local food and drink? There are also beautiful and secluded small beaches nearby, such as El Roble is a rocky beach with its own waterfall and tide pools. Playa El Sur is a beautiful medium size beach surrounded by palm trees and is only accessible by boat. Playa Samara, only 4km to the north, is a much larger beach, with waves generally near knee to waist high, and is a popular place for beginning surfers and families. 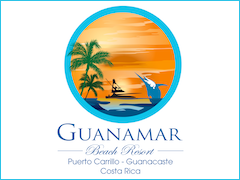 The best accommodation in Puerto Carrillo is Guanamar Beach Resort. It has stunning open views of the whole bay area and at night the sunsets are breath taking. It has a selection of Ocean view, Bay View, Garden and Family rooms, plus a great open-air bar, restaurant and pool. It is becoming extremely popular for Weddings, as everything can take place in one venue, with the most amazing backdrop during day and night. Transport to Puerto Carrillo is improving too, as it is located approximately 41 km from Nicoya, the economic and administrative hub of the region. The total drive now takes about 3.5 hours from San Jose’s Juan Santamaría International Airport (SJO) and approximately 1.5 hours from Liberia’s Daniel Oduber International Airport (LIR). Public buses operate between nearby Sámara and Nicoya several times a day, plus express buses operated by Empresa Alfaro also connect Sámara with San José usually twice a day (except weekends). 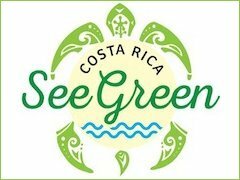 If tourists are taking part in a tour of Costa Rica, it is advised that they use an official company and not do it unaccompanied. Costa Rica Full Vacation is a very professional and highly recommended tour company and has a vast range of tours and trips to choose from. When exploring Costa Rica try and not miss out on at least a day or two in this interesting destination. Guanacaste is a province that Puerto Carrillo is located in and it borders Nicaragua to the north, to the east is Alajuela Province and to the southeast is Puntarenas Province. It is the most sparsely populated of all the provinces of Costa Rica and covers an area of 10,141 km2, with only a population of 354,154. Before the Spanish arrived, this territory was inhabited by Chorotega Indians from the towns of Zapati, Nacaome, Paro, Cangel, Nicopasaya, Pocosí, Diriá, Papagayo, Namiapí and Orosi. The province is bounded on the east by a group of green-swathed volcanoes forming the Cordillera de Guanacaste (which features Orosi, Rincón de la Vieja, Miravalles and Tenorio volcanoes) and the Cordillera de Tilaran. The rivers that tumble out of these steep mountains flow down to rolling flatlands, forming a vast alluvial plain drained by the Rio Tempisque, which empties through swampy wetlands into de Golfo de Nicoya. The Rio Tempisque defines one side of the horsehead-shaped Peninsula de Nicoya enclosing the gulf to the west. The first building was a church was constructed of grass in Nicoya in the 17th Century. In the 18th Century cattle farmers built some homes in the northern part of the province and from that point the region started to gradually grow. The region was baptized after a famous Guanacaste tree that grows in the neighborhood. The climate and culture is unique compared with other Costa Rican provinces. It experiences little rain and consistent heat from November to April, resulting in ubiquitous tropical dry forests as a natural adaption to the dry season conditions. Tourists seek out this dry heat during the North American winter to enjoy the Guanacastecan beaches. Irrigation of the agricultural land is necessary during the long dry period. From May to October, the climate is similar to that of San José, consisting of showers daily and moderate temperatures. Guanacaste is, however, considerably warmer than other provinces in the country located in higher elevations. Most of the population descends from a mix of Chorotega natives and Spaniards, with a significant African mix, as a result of a large number of slaves working the land during the colonial period. The Chorotega and Spanish influences have successfully integrated to form the main cultural elements of their music, literature, folklore, music, bullfighting, horse-riding, food, drink and religion. The province has an economic and cultural heritage based on beef cattle ranching. Most of the area is covered by small patches of forest, scattered trees and large pastures of coarse grasses where Brahman cattle (for beef) and related breeds graze. 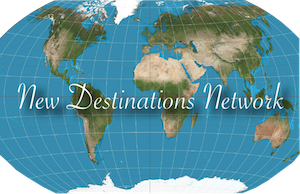 For the past two decade’s tourism has emerged as the new and growing activity in the local economy. The combination of beaches like Playas del Coco and Playa Tamarindo, plus the sunny dry season that coincides with the winter months in northern latitudes have made tourism a key economic activity. A lot of tourists are also attracted by the abundance of natural beauty. The Province has no less than seven national parks like Santa Rosa, Guanacaste and Rincon de la Vieja National Park. Tourism spreads across Guanacaste’s 400 miles of coast line. The main attractions being include warm water, forest land, high mountains, volcanos and coastal ecosystems, which is a breeding ground for vast species of flora and fauna. The two main commercial areas Santa Cruz and Liberia with five surrounding tourism development centers: Papagayo, Flamingo and Conchal (plus the previously mentioned El Coco and Tamarindo). Liberia is an important central location to the five locations, especially as it has an airport too. One of the very popular venues to visit is the animal rehab center; Centro de Rescate Las Pumas, which is located in the heart of the Area de Conservación Guanacaste World Heritage Site. Some people say that Costa Rica is the crowning glory of Latin America, but when you discover a gem in that crown, make the most out of it before everyone else see’s it too. Puerto Carrillo is a gem of a destination in an amazing country!